All I wanted for my birthday was to learn how to make Julia's amazing korokke. Julia is one of my mother's very best friends and someone I consider to be part of my family. They've known each other since before I was born, and I grew up going over to their house, going on road trips together, and spending holidays with them. I learned to ride horses with Julia's instruction, while her husband introduced my brother and I to the awesome world of computer games. I was too young to notice it at the time, but they were very influential in my life, encouraging me in my academics but also my hobbies as well. I'm thankful every Thanksgiving I've had so many amazing role models in my life. I know that sounds super cheesy, but you haven't met them! Our families go camping together, horse trail riding together, and even thrift shopping with one another! I especially like playing board games at their house, and wish my work hours didn't prevent me from seeing them as often as I'd like. Julia's son got me set on this idea when he mentioned that his favorite part of Thanksgiving was his mom's croquettes, which is served with the traditional okonomi sauce (sosu), but also ranch dip. It just wasn't Thanksgiving without it, in his opinion. Ranch dip? On korokke? I had to see this. And then Julia brought some over to my parent's house, and I was hooked. I would have never in a million years thought that ranch would work with croquettes, but it is delicious. I personally liked to alternate between the okonomi sauce and the ranch dip, so each bite sings. Korokke, or Japanese croquettes, are very similar to the French croquettes, but are usually made with a higher ratio of potatoes to meat and served with the same family of tangy sauces that tonkatsu and a lot of fried foods is served with. Needless to say, I became fascinated to learn Julia's version. I loved how these croquettes melded American and Japanese cooking in such a casual and delicious way. I would have never thought to pair croquettes with ranch dressing, let alone when she mentioned all the other tweaks she mentioned to me. For instance, I find that some potato based korroke can be very bland tasting (you need that sauce! ), but hers use a very American ingredient, Lipton's onion soup and dip mix, to give it a well needed seasoning and savory taste. She also let me know she's used crushed up cornflakes in the past instead of panko as well, when panko was harder to find in local grocery stores than they are now. Unlike some korokke recipes, she does not use an egg in the mashed potato mix to bind things together, so it is imperative that you drain the meat if needed so it will not be greasy and cause the korokke to fall apart. I've seen korokke with a higher ratio of meat to potato, but if you go too high, it might not stay together! First wash and peel the potatoes, then add the salt to a large pot of water and bring to a boil. Add in the potatoes and boil until cooked through and a chopstick easily pierces the entire width of the potato. Drain the potatoes and mash completely. Mix in one packet of Lipton's onion soup mix. While the potatoes are boiling, brown the ground beef over medium high heat in a large skillet until all pink disappears. Depending on how fatty your beef is, you may need to drain off some fat. Mix in the onion and heat until they become translucent. Take off heat and mix in two packets of onion soup mix. Mix together the mashed potatoes and meat/onion mixture and let set aside to cool enough to handle. If it's too hot, it might fall apart when it's being handled or fried. While the mix is cooling, make up your ranch dip by mixing the milk, mayonnaise, and powder together until completely combined. Set in the fridge to chill and thicken up. Set up your dredging station by putting the flour, beaten eggs, and panko crumbs in separate bowls, and I recommend a baking sheet lined with parchment paper as a convenient set up for your croquettes. There's no need to measure out the flour or panko, just pour a bunch in a bowl. If you run out while dredging, just grab some more. This is a giant recipe, so don't be surprised at the amount of dredging material you need. 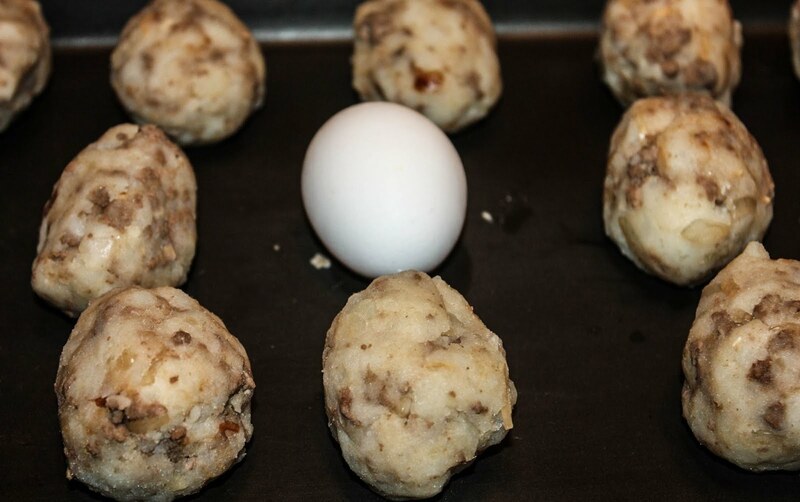 After you're doing setting up, use your hands to shape the croquettes roughly the size and shape of a large egg (just a little larger than a jumbo chicken egg). The traditional shape for korroke is a patty shape, but this little footballs are delicious and their shape makes it easier to avoid them falling apart. Once you're done shaping, dredge each croquette in the following order: flour, eggs, then panko. Make sure that each croquette is completely covered in panko. Set on the parchment paper and continue dredging until all of them are coated, refilling your flour, eggs, or panko as needed. Next, heat your oil to 350°F. The oil should be deep enough to full submerge the croquettes. I like to check the temperature of the oil as I'm really good at overfrying the first sacrificial croquette if I don't. The nice thing about croquettes is that you don't have to worry about them cooking all the way through because they are already cooked inside! Just fry until golden brown and drain on a paper towel lined plate. Make sure that you don't drop in too many at a time as that might cause the oil temperature to plummet. Serve piping hot with the okonomi sauce and the ranch dip! First option: you can freeze them on a cookie sheet in the freezer until solidly frozen right after you have breaded them and before the frying step. Then all you need to do is thaw in the fridge, and fry them up whenever you'd like!